Under suspicion that a North Korean named Colonel Moon is stockpiling weapons to use in an invasion of South Korea and Japan, Bond is sent in under the guise of an African diamond smuggler to kill Moon. After succeeding in his mission, Bond is captured by the North Koreans, held captive and tortured for 14 months. When he is eventually released in a trade for Moon's right hand man, Zao, Bond finds himself out of the graces of her Majesty's secret service. Following Zao to Cuba and in search of the person who set him up, Bond meets Jinx, an American NSA agent who is also looking for Zao. The chase warms up (or cools down as the case may be) in billionaire diamond tycoon Gustav Graves' Ice Palace in Iceland. Here, Bond finds Graves, Zao and a satellite called Icarus which is capable of lighting the globe or emitting a sun-powered laser on a specific point on the globe. After escaping from the Ice Palace and being betrayed by a fellow MI6 agent, Bond and Jinx find themselves battling Graves and the MI6 agent aboard a jumbo-jet plummeting to the earth. Quite possibly the most hyped of all the Bond films, Die Another Day is essentially two movies in one. Fans of classic Bond films will revel at the slow character development, Bond's early reliance on his own skill and knowledge, the inside jokes and references to prior movies and the capture/torture sequence. Those who crave pure, nonsensical action sequences will find their glee with the movie's final scenes both in Iceland and aboard Graves' jet. In the beginning of the movie, Bond really seems to be returning to his Fleming roots. He has to rely on his own wit to get himself out of situations, not Q's gadgets. In fact, Q does not even make an appearance until halfway through the film. Also back are some nuances that have been missing since the Connery era. During the pre-title sequence, Bond takes the diamond smuggler Van Bierk's sunglasses and puts them on while flashing a wry smile at the man. Another example is when Bond infiltrates the DNA clinic; when he runs through a patient's room he stops for a moment to take a few grapes from the bowl by the hospital bed. He emerges from the room nonchalantly popping the grapes into his mouth, just like in Thunderball. It's things like this that make Bond who he is: a suave, sophisticated gentleman agent. Where Die Another Day fails is in trying to combine this classic Bond element with a modern action film. The final sequences in Iceland and aboard Graves' jet contained enough action for the entire movie, if it were spread out evenly. The film would have been better if it had left the plot at Bond's investigation into his betrayal and then looking to even the score between him, Zao and whomever the MI6 turncoat is. This alone is a fascinating plot that, at first, seems to be the focal point of the film at first. However, perhaps out of fear that moviegoers would not accept this retro-Bond story, the movie takes a turn for the worse with the convoluted subplot of the Icarus satellite and the aforementioned ending scenes. In an effort to appeal to everyone, the frantic final 45 minutes of the film reveal that Gustav Graves is actually General Moon, the North Korean General presumed dead in the teaser sequence. Miranda Frost, the better of the two Bond girls, actually works for Graves and that his plot is, in reality, the invasion of South Korea and Japan in an effort to make North Korea the foremost superpower in the world. Had these final 45 minutes been the focal point of the entire movie it might have worked better. Instead, this tacked on plot dilutes an otherwise fine movie. In conclusion, Die Another Day should have ended in Iceland with Bond killing Graves, Zao and Frost in the Ice Palace. Had the credits rolled at that point, the absurd CGI stunt could have been excused and the movie could have gone down as one of the best in the series. Instead, Michael G. Wilson and Barbara Broccoli brought us back to North Korea for perhaps one of the lowest points in the last 40 years. One must look at each pre-title sequence as its own entity; comparing them to previous ones is an effort in futility. After The World Is Not Enough, it seems impossible to have a more exciting sequence. With that said, Die Another Day does a bang up job with this scene. To begin with, both villains are introduced while giving the audience an overview of the actual plot of the movie. The hovercraft chase is great fun and ends with Bond's capture, which leads us the title sequence. The titles for Die Another Day are somewhat of a throwback to Goldfinger with Bond's torture being shown over the images of dancing silhouettes. However, Goldfinger's sequence showed clips from the movie that the audience would see again later. In Die Another Day, most of Bond's torture is shown while Madonna sings her song. I found this to be very distracting as too much was going on at once. As for the women, they looked computer generated with all the fire and ice and although it was appropriate for Madonna's techno theme song, I still would like to see a more traditional title sequence. Much was made of the abundant use of CGI in Die Another Day; there are close to 600 CGI effects as opposed to The World Is Not Enough's 150. Many of these are minor, but others, such as the scene where Bond surfs down an iceberg and away from a tidal wave, are down right absurd. Bond movies have always had stunts that could actually happen and that was part of the charm. Now, Bond movies are relying too much on CGI. The aforementioned scene was truly a disgrace with a completely digital Bond who looked nothing like a real person. Other uses of CGI ranged from explosions to the invisible Aston Martin to the bullet flying out of Bond's gun during the gun barrel sequence (which really doesn't bother me as much as some other people). 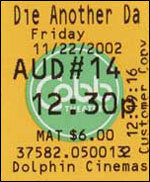 In the weeks leading up to the release of Die Another Day, TV viewers saw more advertisements for Bond endorsed products than for the movie itself. Halle Berry has her Ford Thunderbird, Bond has his Norelco razor and Circuit City wants the average Joe to live like 007. Needless to say, many of the products are just as blatant in the film. The worst scene by far was when Bond checked into the hotel in Hong Kong. There is a close-up shot of a table with Bollinger champagne, a Norelco shaver case, and Brioni shirts. Then, the camera pans over to Bond shaving with his Norelco electric razor: something the real James Bond, a straight razor man, would never do. Other less obvious product placements snuck into the film such as Bond flying British Airways and the Phillips sign in the background of the MI6 train station. Still, however annoying these placements may be, they bring in much needed advertising revenue and media attention for the Bond movies. Not to mention the placements are here to stay so the viewers might as well get used to them. This is the section where I will just go off on a quick rant about things that bothered me about the film. First, what was up with the plane in the end of the movie. The Icarus could destroy army bases and fortified army structures, but a flying plane stuck together for quite some time after passing through the ray. How does Jinx know how to fly a jumbo-jet. I can understand with her background being able to fly a military jet, but a commercial plane? On the subject of Jinx, I'm all for stronger portrayal of women in the Bond films, but Jinx is just too much. It's a Bond film, not a Jinx and Bond film. I'm sure Halle Berry will bring in a whole new audience who would never have seen the movie otherwise, but I still don't like her. This is not a racial comment as some moron took who took the time to e-mail me suggested. It is simply a comment on how Bond is Bond, not someone's sidekick. As for Q, I was saddened to see that the only reference to Desmond Llewelyn was when John Cleese said, "as my predecessor used to say, I never joke about my work." Finally, the idea of having the Aston Martin turn invisible was asinine. What is this, a Star Trek movie? Is James Bond a Klingon now with his cloaking device? Come on!